A cuddly elephant toy from WWF. Fun elephant factbook, bookmarks and stickers. Two exclusive magazines: WWF’s ‘Wild World’ and ‘My Elephant’ with news and updates for your adopted animal. Female elephants like to live in a very close-knit family environment, whilst males tend to spend their time alone. 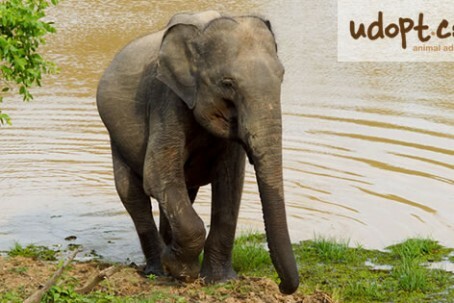 Elephants love to play in the water which is perfect to cool off after long days in the hot sun. In fact they are really good swimmers, with some being found many miles off the shore enjoying a quick dip! They are very family orientated animals and many of them will stay within their herd for the majority of their life – even on their long travels! Elephants are under threat of extinction at human hands. Your kind donation will help WWF to train and equip anti poaching patrols whilst ensuring conservation laws are enforced to protect their habitat. Elephants may have the biggest ears on the planet, but their hearing is surprisingly poor. The back of an elephant’s ear is strangely called the knuckle, and is one of the softest parts of the animal. Elephants can live up to 70 years and spend up to 16 hours a day eating, consuming almost 500 pounds of food. The elephant’s tusks are actually huge incisor teeth, and not horns. They have the largest brain of any animal, which is not surprising given the size of them! I may be one of the biggest animals on the planet, but I need looking after too. Our habitat is slowly shrinking, and humans hunt us for our tusks. You might think that because I have big ears that I can hear everything clearly – unfortunately that’s not the case. I’m a lot easier to hunt than you might think. 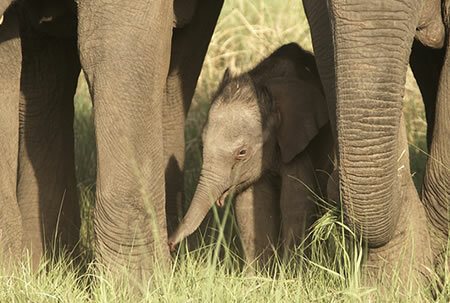 By adopting me you will be helping WWF to protect me and my family from poachers. They also protect our stomping ground habitat by strengthening conservation laws before we disappear off the face of the earth. As the largest land animal on earth, the endangered elephant spends most of its day foraging for enough food to sustain its enormous body. Between sixteen and twenty-two hours of every day is spent eating more than three hundred pounds of food. Elephants are strict herbivores. In the African savannah, elephants eat mostly grasses. In forested areas, leaves from tree tops are the mainstay of their diet. The elephant gets his meal either by pulling down branches with his trunk or by uprooting trees in order to reach the leaves. The elephant’s trunk and tusks are used constantly while foraging. The trunk has finger-like projections at the end that can pluck fruit and leaves quite gracefully while the upper portion of the trunk is also strong enough to push over an entire tree. The tusks are used to dig for water, roots and salt. Elephants love the water and will usually spend part of every day at a watering hole where they keep cool by pulling water into their trunks and then showering themselves. Afterwards, elephants will spray themselves with dust which protects their skin from sun and insects. In deep water, elephants are excellent swimmers. Female elephants and their young live together in herds while the male elephants live alone. Females are much more social than males and will interact with families of elephants outside of their own herd. Elephants can be seen forming beneficial relationships with other herd members. When a female has a baby, all the other females will immediately show an interest and caress the calf with their trunks. All members of the herd will take part in caring for the young. The mother elephant shows a preference for certain elephant females to help her care for a new baby. Usually, these are females that are too old or too young to have babies on their own. These chosen elephants are called “all mothers” and have a relationship to the young that is similar to an aunt or grandmother human relationship. Younger elephants learn to care for the calf by working with older, more experienced, females. All mothers protect the baby as they travel and by help it when it trips, falls or gets stuck in mud. This leaves the baby’s mother more time to forage for the extra food she needs to produce milk for her calf. Adult male elephants live a more solitary life. They roam the forests or grasslands, foraging for food, and only approach herds during mating season. I bet you already know that I’m the biggest animal on land. But did you know that for a big unit, I can walk very quietly? There is a tough and fatty tissue that lines the bottoms of my feet and softens my footsteps. It’s kind of like wearing cushions on my feet. I think that if I didn’t have that padding, the bottoms of my feet would hurt from carrying my big body. There are a hundred thousand muscles in my trunk. That means that my nose has more muscles in it than most animals have in their entire body. The end of my trunk is like fingers that I can use to pick up small things. I can pick up a tiny nut with it if I want. But I can also use my trunk to protect my young. If a lion tried to eat my calf, I would pick up that lion with my trunk and throw it down hard. My trunk is also used to caress and communicate with other elephants. But watch out if you see me holding it straight up in the air. That means I’m warning you to leave me alone! I have my own way of talking to other elephants with low, rumbling sounds. Other elephants “hear” my sounds because they make the ground vibrate. Scientists don’t understand my language yet but they can tell that when I make my noises there are other elephants who listen to me. Let’s talk about my mouth. I spend a lot of time filling it with food. I don’t just have tusks. My mouth is like a factory for making teeth. It’s sort of like humans having baby teeth that fall out and get replaced by bigger teeth. Except, in my mouth, new teeth grow in at the back of my mouth and push the whole row of teeth forward. Then the one at the front falls out. I keep on making new teeth at the back and losing old teeth at the front until I have a full set of adult teeth. People like my teeth a lot. In fact, they like them too much. My teeth are made from ivory which people like to use for making carvings and decorations. It’s against the law, but people still do it and it’s one of the reasons why my species is endangered. People kill us just to take our teeth. We have friends in the form of Elephant charities that are trying to stop people from killing my elephant friends. They help park rangers to stop people from hunting us. A lot of zoos have elephant adoption programs where you can adopt an animal. You don’t get to take an elephant home though. Elephant adoption is a way to protect elephants in the wild. The world’s elephant population is under threat due to conflicts with human beings and the ongoing development of programmes – such as roads and farms – that reduce the space available to allow elephants to roam freely. They are also illegally poached for their ivory which is in demand in affluent Asian countries. At one time, millions of elephants roamed across Africa. In the nineteen eighties, poaching cut the African elephant population in half. The ivory trade was not banned under international law until nineteen eighty-nine and there are still countries where the trade is considered legal. Elephants are still poached today for their ivory and meat. In both Africa and Asia the endangered elephant is at risk because of conflicts with people. Elephants need large territories in order to get sufficient food. Much of this habitat is being lost to farming and logging. When people build farms and roads through an elephant’s migratory territory, the elephant is unable to get to portions of its feeding area unless it crosses through these human areas. Elephants cannot tell the difference between farms and natural forest and will eat whatever food is available as it forages. Often a herd of elephants will destroy large portions of a farmer’s harvest. In many developing areas, farmers resent and fear elephants. They kill elephants in the wild because they don’t want to risk crop damage on their property. Deforestation happens when forests are cleared by the lumber industry and to make room for agriculture. This destroys the elephant’s natural habitat and the elephant has nothing to eat. As low lying lands are deforested, elephant populations are being pushed into areas that do not provide enough food for them. Elephant charities help to maintain elephant corridors. These are safe passages for elephants to follow along their migration routes so that they do not come into contact with people. Many zoos have programs to adopt an animal. 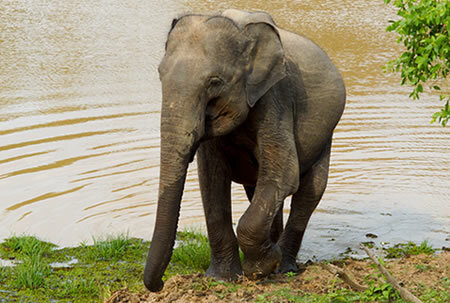 Elephant adoption is a way to provide financial support for programs to protect these animals. Elephants are the world’s largest land mammals. Their noses, gestation period (nearly two years), front teeth, and maybe even their memory, are the longest in the animal kingdom. They, along with their extinct relatives, have lived everywhere, except Australia and Antarctica, from sea level to heights of more than 3600m, in habitats ranging from deserts to rain forests to glaciers. In fact, if it were not for humans, elephants would probably rate among the most successful species on Earth. 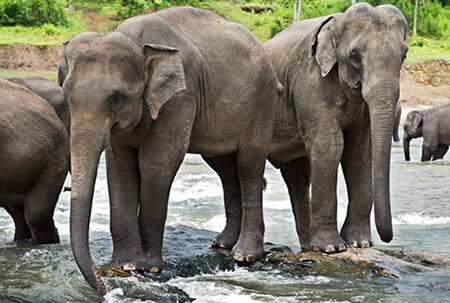 Once forming an almost continuous series of populations from Africa to China, they are now made up of just two main groups, African and Asian Elephants, which are now separated by several thousand miles. Loss of habitat and the ivory trade are the two biggest factors in the decline in elephant population. During the 1980’s over half of Africa’s elephants had been killed and the elephant population was reduced by 700,000. Regarding habitat, the pattern is a familiar one as traditional elephant habitat is carved up for agricultural use and the elephants confined to ever shrinking areas. The elephant population can be found in the tropical rainforests of west and central Africa.